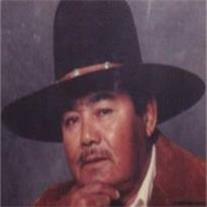 Silvestre Galvan, born Dec. 30, 1931, was called home Tuesday, June 12, 2012. There to meet him were his wife Celia and children Susana and Jimmy. Left to carry on his traditions, are his children Irma (Oscar) Montano, David Galvan, LC (Charles) Longmeyer and Danny Galvan. His legacy will be continued through his 9 grandchildren and 28 great-grandchildren. After farming for 44 years he retired to spend more time with his family. Known for his fast driving, the silver egg and giving nature, he will be missed by all. Funeral services are Monday, June 18, 2012 at 1 PM, preceded by a visitation at 12 PM, at Bunker’s Garden Chapel, 33 N. Centennial Way in Mesa.